We are delighted to be able to present our chosen charity this year with a cheque for £600 raised by selling raffle tickets to win fabulous GHD products. The Charity we are honoured to support is The Brain Tumour Fund | Silas Pullen Fund, inspired by Silas aka The Mighty Boy. 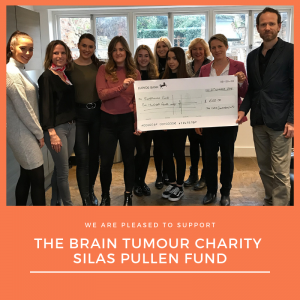 The Silas Pullen Fund is a supporter group set up under the umbrella of The Brain Tumour Charity. The Brain Tumour Charity is the UK’s largest dedicated brain tumour charity and is committed to fighting brain tumours on all fronts. Double survival within 10 years in the UK. Our goal is to halve the average years of life lost to a brain tumour from 20.1 to 10 years by 2025. Halve the harm that brain tumours have on quality of life in the UK. Our goal is to halve the harm caused by brain tumours by 2020, from a baseline measure which we will agree with clinicians and patient groups by the end of 2015. They want to improve survival rates and transform quality of life for patients. For more information on The Brain Tumour Charity see here. Although our GHD raffle has been drawn and the winner notified you can still donate via Just Giving to this very worthy cause and find more information on The Silas Pullen Fund see here.